Roed, Bente and Sandra Buhai Barz. "Inuit Printmaking". The Canadian Encyclopedia, 07 March 2017, Historica Canada. 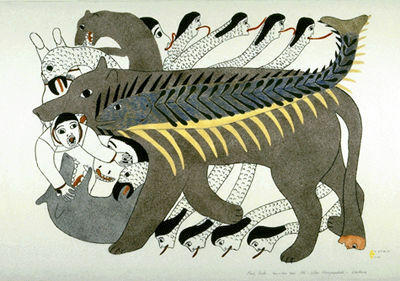 https://www.thecanadianencyclopedia.ca/en/article/inuit-printmaking. Accessed 18 April 2019. While carving is a viable enterprise in most Inuit communities, printmaking requires special skills and sophisticated equipment to compete in an international market. Image: University of Lethbridge Art Collection/\u00a9 Dorset Fine Arts. While the Inuktituk language does not have a specific word for art, the Inuit have decorated garments and carved objects since prehistoric times. Contemporary carving activities were promoted by James A. Houston, an artist and government administrator in 1949, who travelled to the Arctic to explore ventures that might supplement Inuit incomes. In 1957, printmaking was introduced at Cape Dorset, Nunavut, also with Houston as the catalyst. Inuit printmaking is more anomalous than carving in that it does not have substantial historical precedents, although there are affinities with incised carvings on bone or antler, women's facial tattoo marks, or inlay skin work on clothing, mitts and footwear. 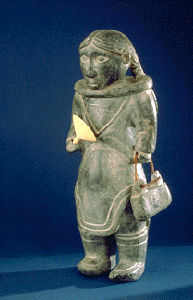 Carving materials such as stone, bone, antler, wood and ivory were available locally, but paper and drawing tools were unknown until introduced by early explorers and missionaries. 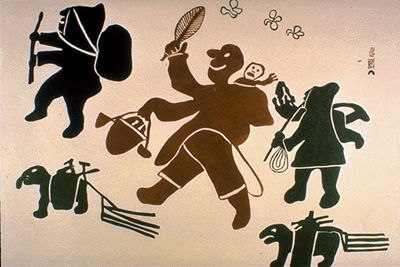 While print activities have a short history in the Arctic, and the techniques originally differed somewhat from those in the south, many Inuit have shown a high aptitude and enthusiasm for this new medium and have used the art form to provide a visual record of traditional life, both animate and spiritual. The Inuit were encouraged to establish co-operatives, where none existed, to assist in the production and marketing of the art (see Inuit Cooperatives ). The methods of production were patterned on those of traditional workshops; Houston studied with the Japanese print artist Un'ichi Hiratsuka for 5 months in 1958 and returned to Cape Dorset with Japanese papers and practices. Many of the methods and work patterns refined at Cape Dorset were later adopted by other print workshops. Inuit artists usually make the initial drawings in their homes, as only a few workshops and communal work spaces are available. The finished drawings are brought to the co-operative to be exchanged for money. If a drawing is selected for print editions, the artist who drew the image does not commonly transfer it to the print medium; this is done by another skilled individual, and, in several co-operatives, a third person prints the image onto paper. However, there have been numerous exceptions over the years. Povungnituk and Arctic Québec artists usually carve their images directly onto the stones, and in Cape Dorset, for example, a number of the more experienced artists often draw their images directly onto the litho stones. Lately many artists in Ulukhaktok and Baker in particular have been encouraged by their art advisors to do the entire process. This changes the dynamic from a collaborative process with the printer to a more immediate rendering of the artist's own concept. Usually each print will be signed or stamped with the names of the artist and the printer in various combinations of English and Inuktitut syllabics as part of the print inscription. Traditionally, the print will have a pictographic symbol denoting the co-operative from which the print originated (eg, Cape Dorset, a stylized igloo; Holman, an ulu inscribed with the word Holman); in the past, the stylized syllabics stamp or blind-embossed symbol of the now defunct Canadian Eskimo Arts Council indicated that the work was authentic and met approved standards. Inuit prints are generally not released for sale individually but as an annual collection portfolio, although many individual prints have been released as special commissions. The selection of the prints comprising the annual collection in the NWT communities was supervised in the south by a government-appointed jury, the Canadian Eskimo Arts Council, until it ceased operation in 1989. From the beginning, marketing, including quality, quantity and price control of prints produced in the NWT, was co-ordinated by Canadian Arctic Producers for prints from Arctic Québec, by La Fédération des Coopératives du Nouveau-Québec, and sold through designated commercial galleries. Currently, CAP distributes only the Holman [Ulukhaktok] and Baker Lake collections, which are now issued infrequently. Pangnirtung distributes its own prints, as does Cape Dorset through Dorset Fine Arts. FCNQ is not now an active participant, since POV has produced no collections since 1988-89. The number of prints per edition is controlled. The first prints were usually issued in series of 30; today the size of the edition varies but the norm is 50. Inuit prints tend to differ in their subject matter and their formal concerns. Traditionally, the content of Inuit prints was based on the animals, birds and marine life of the Arctic; on the old ways of life; on legends and mythologies; and on shamanistic practices, creatures and spirits. The artists rarely incorporate contemporary life styles, pure landscape, or abstract or non-objective imagery. Artists such as Pudlo Pudlat , Etidlooie Etidlooie and Jessie Oonark pictured airplanes, helicopters, snowmobiles and rifles, etc., but they were the exceptions. Inuit printmakers have also differed from their southern colleagues in their use of space. In the past they may have indicated space by overlapping or by incorporating a ground line, but in general, they did not show figures and objects existing as 3-dimensional bodies in a believable space. Most images were flat and were more concerned with depicting pattern and decoration than volume. Today, however, some artists, especially those newer to the programs, are more likely to use Western spacial concepts. The preferred print technique in the early decades was that of the stonecut, which evolved through experimenting with such material as bone, wood and linoleum. The stonecut is a relief technique, similar to the woodcut. The stencil technique was a logical progression from the traditional inlay designs that women employed to adorn skin garments. Engravings and etchings were also produced, and later serigraphy and lithography were added - techniques that are particularly adaptable to colour. Until recently, Inuit artists seldom left their settlements to engage in formal art training, learning only from each other and from southern advisors who came to work in their community. Because of this, their ideas tended to be somewhat homogeneous within each regional centre. This commonality did not spill over into the other communities, however, and today is less obvious even within the same co-operative. Printmaking experimentation began in the community of Cape Dorset in 1957, with the first exhibition of prints issued in 1959. Print production followed at other centres: Povungnituk 1962, Holman [Ulukhaktok] in 1965, Baker Lake in 1970, Arctic Québec community collaborations in 1972, Pangnirtung in 1973 and Clyde River in 1981. (The Baker Lake printshop closed in 1989, as an entity of the Sanavik Co-op, but still produces sporadic collections, sometimes with Arctic College. After little activity from 1989 to 1991, printmaking was revived at Pangnirtung in 1992, under the aegis of the Uqqurmiut Inuit Artists Association, as the Pangnirtung Community Print Collection. Clyde River produced only three collections through the Igutaq Group, although some of the artists still issue prints through other independent entities, as do artists from communities who do not have their own print programs. Cape Dorset, with the longest history and the most continuous and professional management, has consistently produced prints of high aesthetic and technical quality.Kenojuak Ashevak and Lucy Qinnuayuak are both well known for their depictions of birds. Kenojuak's centrally located birds, often emblematic owls like the one on the 6-cent postage stamp issued in 1970, are elegant and decorative images that rely partly on shapes, partly on colour for impact. Lucy's birds tend to be depicted in an asymmetrical manner and with a good deal of humour and whimsy. Pitseolak Ashoona (1907/8-1983), a prolific artist with a great sense of humour, created many images that provide visual narrations of the nomadic Inuit life, showing how families were very much dependent on the Arctic creatures for survival. Jamasie Teevee (1910-1985), who also used lithography and stonecut, drew his own images on many copperplate engravings. He often filled the paper's rectangular space with multiple tightly arranged figures. Parr (1893-1969), one of the oldest Cape Dorset artists, depicted animals and hunters in a direct and simplified, almost primeval, manner. Pudlo Pudlat (1916-1992) was among the very few who also pursued landscape as a subject matter. Kananginak Pootoogook is a master printmaker, drawer and carver. His works incorporate many details and visual descriptions of traditional artifacts, Arctic birds and animals. He was also one of the early participants in the Cape Dorset print program who worked with James Houston and translated into prints the drawings of his father, the great leader Joseph Pootoogook (1887-1958). Povungnituk artists often use the stone block itself as an integral part of their print images. Many prints show the irregular outlines of the block, which boldly frames the interior scene and encourages a powerful visual statement. Contrary to practices in other centres, many Povungnituk artists draw, cut and often print their own images. Especially in the early days, they frequently carved the image directly onto the stone. Joe Talirunili was a carver and an early printmaker. He often used events of his own life, stories of other hunters, or the migration theme as the basis for his narrative prints where activities are arranged akin to the modular formula used in comic strips. He frequently inscribed a syllabic explanation as part of the print, then signed it, JOE, in English. The renowned storyteller Davidialuk preferred isolated and specific scenes or figures and often inscribed the name of the story or its protagonist in the stone itself. 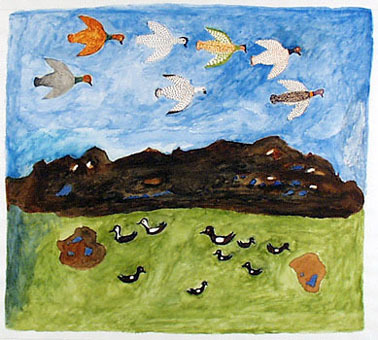 Josie Papialuk (Paperk) (1918-1996) used bird imagery in many works, rendered in a whimsical and decorative manner. Holman [Ulukhaktok] artists used the local limestone for their stonecut prints in the early years, but because of the poor quality of the stone, they were soon utilizing stencil and lithography techniques. By 1987, woodcuts had become popular, offering an easier carving surface and availability of material. Storyteller, shaman and printmaker Helen Kalvak communicated ordinary, legendary and spiritual events through her prints. Mark Emerak (1901-1983) depicted hunting scenes and Agnes Nanogak(1925-2001) drew many powerful images relating historical and legendary events in bold black shapes on white paper. Until the mid-1980s Holman prints tended to de-emphasize colour or use it sparingly. In more recent editions, with new advisors and the participation of younger artists such as Mary K Okeena (b 1957), Elsie Klengenberg (b 1946), Susie Malgokak (b 1955), and Peter Palvik (b 1960), all of the printmakers have not only made extensive use of colour, but many are also doing much of their own printing. Unfortunately, the Holman printshop has become less productive, turning out only special print commissions rather than collections. The original inhabitants of the Keewatin district depended on caribou and fish. Settled in the late 1950s and 1960s in the inland community of Baker Lake, they still relied on those creatures as a main source for their artistic imagery, as may be evidenced in the prints by Luke Anguhadluq. Jessie Oonark and her daughter, Victoria Mamngushualuk Kayuryuk (b 1930), often depicted scenes from legends, and sometimes several events within the same composition. Oonark, also a fine textile artist, frequently used bold, decorative and colourful patterns in prints with a single figure. William Noah (b 1943) (or more often his wife, Martha Noah), Nancy Kangeryuaq Sevoga (b 1936), and Simon Tookoome (b 1934) are among the few artists who print their own images. Tookoome is known for his unique treatment of faces; for instance, he might insert animal figures into the cheeks of human faces, or arrange human faces within and along the limbs of a figure. His carvings also often reflect his print image treatments. Experimental print-making programs were carried out in 1964-66 and 1968, and the first catalogued collection was issued by the Sanavik Co-operative in 1970. Of all the artists who stayed in the program after the initial try-outs, only Jessie Oonark's images remained pretty much the same and are readily identifiable without written inscriptions. Baker Lake print images and techniques have from the start differed widely from those of other communities, perhaps because of the extensive use of colour and coverage on the paper, as well as the subject matter, which tends more towards depictions of the mind than the landscape. The initial Pangnirtung collection was issued in 1973, although experimental programs were tried in 1971-72. The prints focus on daily activities and on whaling, as the area had served as a whaling centre since the 18th century. Whaling scenes are included in prints by Geetaloo Akulukjuk (b 1939) and Simon Shaimaiyuk (1915-1999). Andrew Qappik (b 1964) is a prolific and talented artist and printmaker who has mastered most techniques, following in the footsteps of his uncles, Imoona Karpik (b 1950) and Solomon Karpik (1947-1989). Known for their stencil prints, Pangnirtung artists Jacoposie Tiglik (b 1952), Josea Maniapik (b 1941), Enookie Akulukjuk (b 1943) and, more recently, Jolly Atagooyuk (b1963) are responsible for printing many of the colourful images of Elisapee Ishulutaq (b 1925), Malaya Akulukjuk (1915-1995), and Ida Karpik (1939-2002). The well-known carver Lipa Pitsiulak (b 1943) has also been involved in the print program from the beginning, often coming in from his outpost camp to participate. The most recent of the print centres, the Igutaq Group of Clyde River was organized in 1974 and launched its first collection in 1981. It has employed the stencil technique extensively and the artists are interested in soft gradations of colour, as competently demonstrated in the prints by Lydia Jaypoody (b 1926), Jeanie Tiqulliarq (b 1958), Elishah Sanguya (b 1957), and Reepika Iqalukjuaq (b 1943). With one exception the printing in Clyde was done by a studio group made up of at least two printmakers. The annual collections lasted only three years, ending with the 1984-85 collection. Although most of the original print-producing co-ops are on the wane, other groups and individuals have taken up some of the slack. These include longtime independent producers such as Arts Induvik Canada/Baffin Island Graphics, Iqaluit and Montreal, Studio PM (Paul Machnik), Montreal, and Nunavuk Arctic College. These groups have conducted workshops and issued collections, often introducing new techniques. Both experienced print artists and new recruits have participated. Studio PM, which usually produces the etchings for the established print co- ops, has also started to introduce drawing and print techniques in communities where there are no ongoing enterprises. Over the years and continuing, some independent artists have also produced their own collections using a variety of print facilities. From the beginning of the printmaking programs in the Canadian Arctic, in fact starting with the experimental years in each community, a great many prints have been produced that are not part of the co-ops' annual print collection. Sometimes they are overruns or anomalies, but mostly they are prints offered as special collections by the co-ops for their own sales or as commissions for governmental projects and/or retails sales by dealers and commercial organizations. They may or may not have their own catalogues or brochures, but are nevertheless legitimate offerings. In recent common usage they are sometimes referred to as "uncatalogued prints, collections or commissions," to differentiate them from the community's regular, annual collection. The late 1980s and early 1990s saw the closing of a number of Inuit print shops, and delays in the release of annual print collections for financial or technical concerns. The unprecedented spectacle of long queues of collectors arriving before daylight hoping to purchase a favourite print during the annual collection sales became a phenomenon of the past as the art of the Arctic was affected by the same economic downturn that has impacted art scenes elsewhere. Also, younger artists are not attracted by the hard work and staying power that is required to produce consistent and technically flawless collections. Subject matter remains somewhat static and lacks the artistic exploration necessary to keep up with competing art forms. These problems are constantly being addressed in Cape Dorset and somewhat in Baker Lake with an infusion of outside art advisors and also with courses and workshops conducted by Arctic College and other creative entities. As well, the persistent presence of media exposure and increasing outside travel has brought a different perspective. Even with a downturn in production, the influence of printmaking in the Canadian Arctic cannot be underestimated. The print programs were started as a stab at some economic stability for the Inuit. No one ever imagined that Inuit prints would become such a recognized and important expression of graphic art throughout the world. A handful of co-operative ventures have resulted in a production of more than 8000 images created by hand and in multiple editions. And most important, more than 400 artists and 150 printers and assistants have participated. In less than 50 years, creativity has brought unexpected fame and much fortune to a small, remote part of the Canadian Arctic and immense pleasure to a ever-widening group of enthusiasts. Inuit Prints: Japanese Inspiration: Early Printmaking in the Canadian ArcticAn extensive catalogue for the groundbreaking Canadian Museum of History exhibition that explores the intriguing link between Inuit art and traditional Japanese printmaking. From indigo.ca. Inuit Prints: Japanese InspirationScroll through selected images from an exhibit that shows how Inuit artists were influenced by Japanese printmaking techniques brought to Cape Dorset by Canadian artist John Houston. Click on “PDF” for an overview of exhibit themes. From the Canadian Museum of History. Inuit Prints of Cape DorsetChronological online exhibit featuring many outstanding Inuit arts and their art from the website for the Canadian Museum of History.